The influence of Charles Taylor’s magisterial book A Secular Age continues to permeate. Refuting simplified readings (the rise of science; Darwin etc), he instead offers layers of insight, tracking a complex, history of the past 500 years, noting the sociological, philosophical, psychological, political and theological dimensions of the disenchantment of existence. He presents a staggeringly myriad of helpful frameworks for unpacking the nature of western culture today, and explores why this ‘imminent frame’ contains vexed, almost schizophrenic, cross-pressures and dissatisfactions, and an ongoing human innate desire for ‘fullness’. But I’ve not yet read it all, and next semester I’m participating in a small group led by a Taylor scholar (and former colleague) James McEvoy, working carefully through the text, guided by his reflections and insights. McEvoy is a Catholic Priest, (Taylor is himself a practising Catholic) recently released Leaving Christendom for Good: Church-World Dialogue in a Secular Age, which joins a tide of secondary literature on Taylor’s text. I’m still reading this, but he suggests how a particular document from Vatican II (Guardium et spes) offers a motif of dialogue to assist church-world relationship, with particular reference to evangelisation and public theology. I might write more once I’ve finished it, but he offers a helpful overview of Taylor’s work. 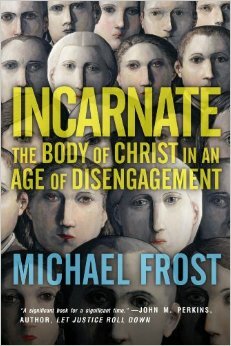 Another, in a different stream, is Michael Frost’s recent book Incarnate: The Body of Christ in an Age of Disengagement which picks up on Taylor’s idea of ‘excarnation’ as a term to describe the shift out of embodied, enfleshed forms of religious ritual, worship, and practice to those which reside more ‘in the head’. It’s a particularly accessible and helpful outline of how this shift has influenced the church, and how the reality of Christ as the incarnate one is the compelling model for how the church can faithfully embody it’s God-given mission in western culture. He has a particular gift for inducing a passion for full-blooded discipleship. But of particular interest is James K.A. Smith’s How (Not) to be Secular: Reading Charles Taylor which is an especially helpful guide to Taylor’s book, something of a condensed manuel for A Secular Age, noting implications for Christian practitioners. For the vast majority of Christian leaders, this is the essential read to access Taylor and understand our current western culture. A fantastic overview, which I very highly recommend. He also well references the flat, cross-pressured experience of modern secular life within recent popular music (Arcade Fire) and novels (David Foster Wallace) which always goes over well with the culture vultures.